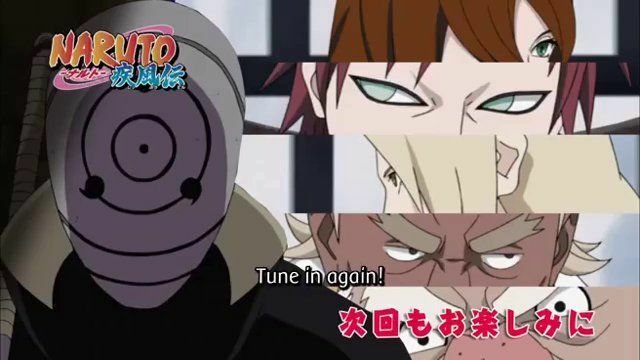 You are going to Watch Naruto Shippuden Episode 326 English subbed online free episodes with HQ / high quality. Stream Anime Naruto Shippuden Episode 326 Online English sub Four Tails, the King of Sage Monkeys. After killing White Zetsu using his Eternal Mangekyo Sharingan’s Susano’o, Sasuke sets off to destroy Konoha. Back at the battlefield, as Kakashi and Guy learn that Tobi is using a large amount of chakra to assert full control over the Tailed Beasts, they hear the voice of the Five Tails as Tobi subjugates the creature. Voicing his disdain for humans’ treatment of them, the Nine Tails recaps his own subjugation under Madara and then by the Uzumaki Clan from Hashirama’s wife Mito to Naruto’s mother Kushina. After being swallowed by Roshi after he fully transformed into the Four Tails, Naruto meets the Tailed Beast himself, who insists that he be called by his actual name: Son Goku. After brief discussion about the humans’ treatment of the Tailed Beasts, upon which Naruto learned the Nine-Tailed Fox’s true name is Kurama, Son sees Naruto to be an exception. Wanting to know if Naruto’s desire to aid him and the other Tailed Beasts would not waver, Son asks the youth to free him from his chains.